Anthony has never really shown any interest in reading and writing (nor, for that matter, much interest even in being read to). It's been almost a year since he could write his name in English and in Japanese, but that's about as far as he's cared to take it. As I've written before (How To Raise a Bilingual Child and More on Raising a Bilingual Child), I am careful not to ram linguistics down his throat, lest he turn away from it. Many of Anthony's peers can read and write fairly well, but still, at his age (a week shy of turning six), I'm not concerned with his inability to read and write. On the other hand, his almost total disinterest in them is a growing concern. So, we were amazed this morning that he, all by himself, before Fumie and I got up, wrote a note to Mommy. Fumie awoke to find it propped up against her computer, showed me, and we both dropped our jaw. 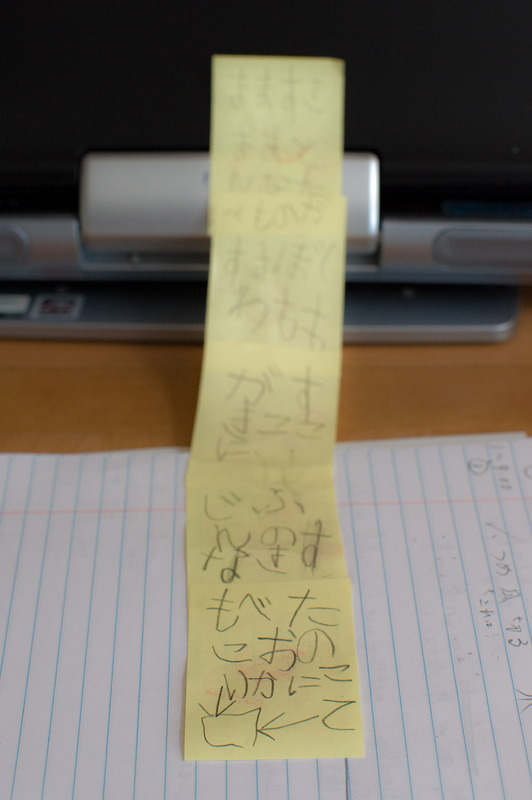 It appears that he started writing on a Post-It type note, then kept adding them as he continued the message. Sometimes he wrote in the wrong direction, there's no punctuation, and a few other mistakes, but wow, it's just wonderful to us. まま すき。 Mommy, I love you. まま、どんな たべもの が すき？ Mommy, what kind of food do you like? ぼく は もも が すき。 I like peaches. ここ に じぶん の すきな たべもの を ここ に かいて。 In here, write the kind of food you like here. At the bottom, after the text, are arrows pointing to a little box in which she's to write her answer. He doesn't know how to write all those characters yet by himself, so he used a little electronic “learn the letters” type of thing – pictured below – to make sure he got the right characters. The alphabet he used (Hiragana) is pretty much straight phonetic, so there's no “spelling” involved here, so in this respect what he did is substantially easier than the same feat would be in English. There are a few special grammatical situations where sounds are written differently when they are a particular part of speech, and he got those wrong (he wrote わ where he should have written は, お where he should have written を), but that's grammar and somethig that can be addressed much later. Frankly, it could have been totally indecypherable and we would have still been happy... it's his interest in writing that we're overjoyed at. In this case, it really is the thought that counts. Wow! Now, what did Fumie write in the little square as an answer? 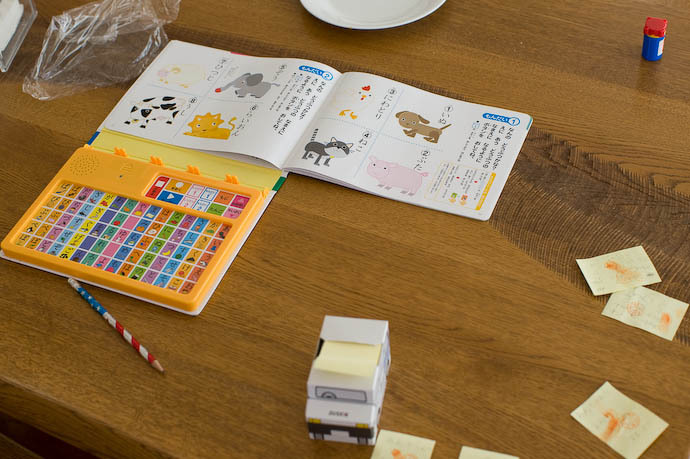 ぼくも、ももがすきです！ Your son’s so smart for learning and writing all by himself…that’s awesome! That really is awesome 🙂 Once he sees the doors this opens for him in both expressing himself and interacting in the world around him you’ll not be able to stop him writing! Congratulations. But I am not surprised. Kids differ a lot at the time of expressing their inner-learnt abilities (lazy perhaps !). Probably he had inferred the writing method long ago but did not bother to show it. What SURPRISES me is that he attends a quality (!) school in Japan (I do not know the Japanese educational system – I am European – but I believe it should be very good) and the school (even at the pre-school level, just a bit before entering normal school at 6 years old) did not try to teach him to write his name (or even a few letters). The preschool he goes to specifically does none of that kind of education. They figure – and we agree – that it’s much more important at this age to learn how to be a member of society…. about how to be good friends, how to get along, and how to make up after a fight. How to decide things for themselves, and how to decide things when a member of a group. Your post also made me search a bit about the Japanese language and if Hiragana is the alphabet of use (just 80 characters if I am not wrong) then I will not try to learn chinese as I intended and will dabble into Japanese a bit. Your blog also was a great introduction into Japan for me (and I thought Japan was very crouded ! !, where is all that empty space filled with trees and ….). Could you please recommend me a basic book (basic please) in learning Japanese ? and also what magazine written in easy language should I subscribe in order to practice ? (I prefer magazines about cars, photography and computers). Congratulations also for the tasty “titling” and “photo commenting” of your posts. I must confess I am a bit jealous of you in that you have a lot of time to pass together with your son, who by the way is a good poser for photography. I have two kids and I have missed a lot of their growth due to work .. (of course, even though I have a very easy and shortened work schedule), not to say that they have revolted (!) and not pose so easily anymore. So, best wishes for your family. (7) When the writer chooses to be weird for things like political advertisements, restaurant menus, or other weird things. Guess which two cases are most relevant in these notes? Now, Kanji up to some level are taught in order in school. Students whose names come early learn to write their names early. Students whose names are more difficult might still be stuck writing their names in hiragana years after their classmates are writing their names in Kanji. Adults get to show off by writing documents using difficult Kanji, but primary school students suffer a correspondingly excruciating level of embarrassment. The story about Japanese names was told to us by a Japanese Japanese teacher.